Well how about this weather, now this is more like it, this is how Autumn is supposed to feel. So we are now in the "home stretch" for October and with next weekend being Halloween there aren't too many shows, but the ones there are should be fun, a lot will have a Halloween theme to them, so let's take a look at what's going on. On Sat Oct 30th is the 8th Annual Pumpkin Patch Classic Car Show at Heritage Park in La Verne from 10am - 3pm. The show is open to Pre-1975 cars and trucks and will also feature a pumpkin patch, wagon rides, live music and plenty of food. This is an event that is fun for the whole family and a great way to pick out your pumpkin just in time for carving. On Sat Oct 30th is the 1st Vet's and Pet's Charity Car Show at Flo's Airport Cafe at the Chino Airport from 11:30am - 3:30pm. This is a show that will benefit 2 great causes, 50% of the proceeds will go to West Valley Animal Shelter and 50% will go to VFW Post 11546. If you are interested in showing your car there is no pre-registration so be there at 10am for set-up, also there will be a doggie dress-up contest so be sure to bring your four legged friends and show them off too. On Oct 30th is the Bob's Big Boy Norco Halloween Spooktacular Rodder Show from 4pm - 7pm, and will feature a costume contest, raffles, games and plenty of family fun. On Sat Oct 30th at Auto Club Speedway in Fontana will be the Street Legal NHRA Drags, gates open at 6am, you can race your own car for only $20 and spectators are $10. On Sat Oct 30th is the Metro Pomona Cruise Night held in Downtown Pomona from 5pm - 10pm and will feature live music, vendors, food and raffles. Well there is a lot to choose from and still keeps Halloween open to prepare for all of the scary fun. 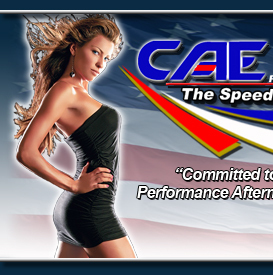 We are also pleased to announce that you can now follow CAE PERFORMANCE THE SPEED SHOP on Facebook, just click the link at the top of our website and join us. You also may have noticed the YouTube button towards the bottom of our website, well coming soon we will also be posting videos from some of the events that we attend. So grab you jacket and get yourself a nice hot cup of coffee or coco and head out to one of the fun shows, and you never know we might just bump into each other.